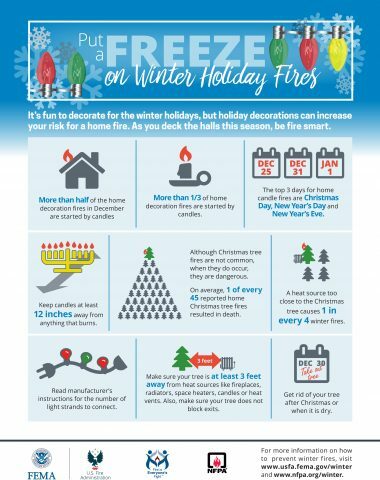 The Duncanville Fire Department and FEMA want to remind residents to be “fire smart” this holiday season and take steps to reduce the risk of house fires. We hope you have a safe and happy holiday! The kitchen is the heart of the home, especially at Thanksgiving. Kids love to be involved in holiday preparations. 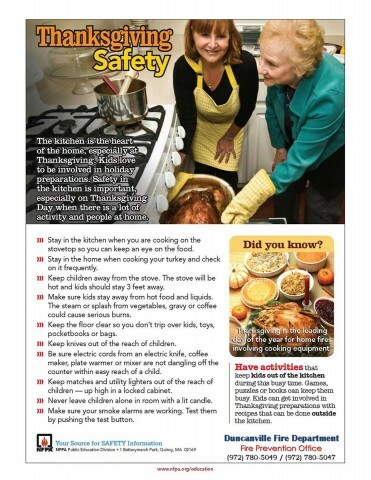 Safety in the kitchen is important, especially at Thanksgiving Day when there is a lot of activity and people at home. Keep matches and utility lighters out of the reach of children–up high in a locked cabinet. Thanksgiving is the leading day of the year for home fires involving cooking equipment. Have activities that keep kids out of the kitchen during this busy time. Games, puzzles or books can keep them busy. Kids can get involved in Thanksgiving preparations With recipes that can be done outside the kitchen.